Precision Box Co collapsible crates are a simple yet valuable product for logistics operations giving great flexibility with delivery and storage. Our collapsible crates are a system which can be assembled and dis-assembled with very little effort. Once used, our collapsible crates can be dismantled and stacked to reduce warehouse bulk until they need to be used again. Fold them flat, stack them up and store them away. 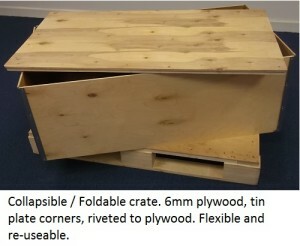 We can produce these crates with a very short lead time and we can supply a range of sizes. The collapsible crates are durable, lightweight and offer streamlined storage. They are reusable, versatile and very cost effective. Ideal for work or home. A Logo, message or instructions can be stencilled onto panels.